It is evident that the Red Head Beach Cliffs have been experiencing erosion for decades, which has resulted in homes being moved further away from the water to prevent them from falling directly into the Bay of Fundy. In 1998, in an effort to mitigate further erosion and property loss, 4,000 tires were placed along the banks of the beach by a group known as the 'Red Head Shore Restoration Committee' and were anchored into the sand using 3/8" rebar anchors. This structure was designed to act as a breakwater to protect the clay slope from further erosion. By 1999, a number of strong Winter storms had weakened the structure considerably, the rebar anchors had loosened, and many of the tires had floated free from their anchors, resulting in a failure of the structure. Not only did this result in scattered tires over a large portion of the beach, but it also created human health and safety risks as a result of hundreds of pieces of rebar and steel-reinforced tire remnants jutting from the sand and water. 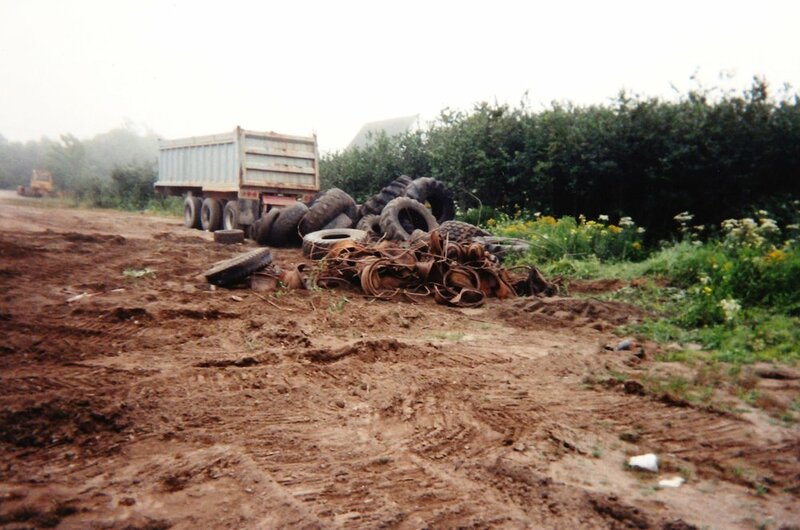 Subsequent cleanup efforts by ACAP Saint John and various community and governmental partners removed over half of the dispersed tires and over ten tonnes of steel (tire rims and rebar) between July and December of 2000, and again in August of 2001. The project not only resulted in an improvement in the environmental conditions on the beach, but also provided valuable information about future cleanup initiatives. While the existing tires do not pose any chemical threat, they do contribute to habitat loss, and their status as an eye-sore is an issue amongst residents. Almost 18 years later, during the 2017-2018 field season, ACAP Saint John set out to remove and recycle the accessible remaining tires and rebar, as well as any other marine debris. Tires were mapped and tracked for any movement that they may encounter over time due to coastal erosion. 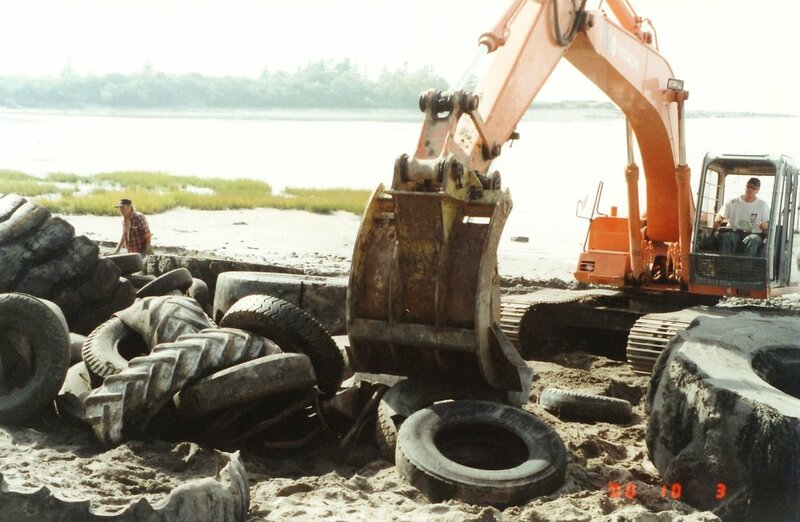 When preparing for this project, it was made clear that we would encounter an issue with recycling the larger tires, often referred to as off-the-road (OTR) tires, that remained on the beach, as this was also seen as an issue during prior cleanups. OTR tires include heavy mining tires, as well as agriculture and industrial tires. These large tires are deemed too large for the recycling processing plant in New Brunswick (Tire Recycling Atlantic Canada Corporation [TRACC]) that diverts millions of end-of-life and old scrap tires from landfills and recycles 98% of them into new rubber products. Although the province of New Brunswick has an excellent Tire Stewardship Program (Recycle NB) that allows citizens to bring their old, unwanted tires to any garage or store that sells tires, only tires 24.5” or less in diameter size are accepted into this program. Unfortunately in this case, most of the tires remaining on the beach would exceed the size for recycling. The location and the movement of the tires were monitored using aerial photography that was taken monthly throughout the season and it was deemed that roughly 175 tires were counted along the beach. We were able to remove approximately 30 tires from the beach, along with 125kg of garbage and marine debris. The tires that were too large (over 24.5” in diameter) to be recycled were left on the beach as removing them with no place to go would be counterproductive. The recycling of OTR tires can be seen as an issue in many Canadian provinces. Due to their composition and size, many tire recycling facilities do not have the machinery to shed these large tires, leaving organizations to deny OTR tires in their recycling programs. 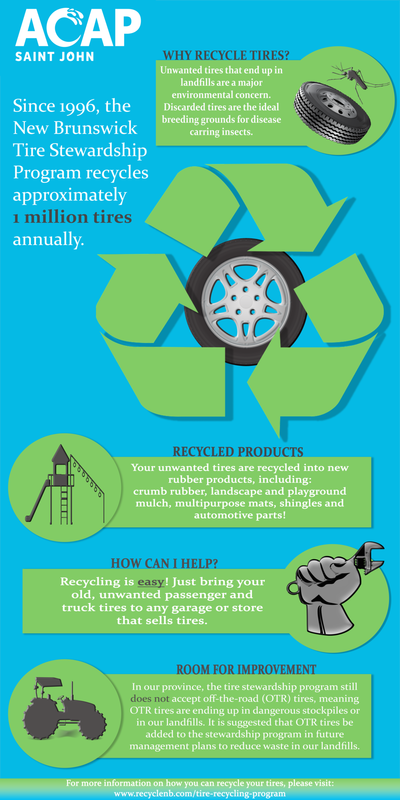 If OTR tires cannot be recycled, it leaves no choice but to either stockpile them or send them to landfills. It is suggested that the TRACC would be the ideal candidate to accept OTR tires due to its central location and should consider investing in the special equipment that is required to shred these large tires. With the collaboration between TRACC and Recycle NB, a levy could be placed on the purchase of new OTR tires. This would ease the cost on the equipment used to recycle the OTR tires. If TRACC could invest in the necessary equipment needed to shed large OTR tires, tires from across the Maritime provinces could be sent to the facility to be turned into new rubber products and kept out of landfills.